So since we're on the topic of coaches, I'm going to take one of the greatest coaches the sport has ever seen: Scotty Bowman. 95-53-16 in the regular season, 23-10 with a Stanley Cup ring in the playoffs. Also led the Pens to their first 100 point season in franchise history. Bowman's attention to detail and relentless coaching style kept his players grounded and focused on what mattered most, winning a Stanley Cup. A master of motivation and mind games, he knew how to get the most out of every player he handled, from superstars to role players. In Pittsburgh, Bowman moulded the multi-talented club into a well-rounded squad that could control play at both ends of the ice. Bowman's stout leadership helped propel the Penguins to the 1992 Stanley Cup final, where they were crowned champions for the second consecutive season. I think he'd be able to do wonders with just about any team you threw out there. And for back-up goalie, I think I'll take Brent Johnson. He only played in 65 games, but when you extrapolate the "games dressed as a backup", he more than makes it over 100. IMO, he's exactly what you want a back-up goalie to be. Someone who (until his last year, which is more a product of injuries) can come in and spell the starter and give the team a chance to win (look no further than his first 2 years here: 10-6-1 with 2.76 GAA and .906 SV% and 13-5-3 with 2.18 GAA and 2.11 GAA in 09-10 and 10-11, respectively). Had he not been injured in 11-12, I believe we would have seen similar numbers. Yeah, I was thinking about taking a coach with the last pick, but decided against it. Can't go wrong with either coaching pick yet. I'm not totally wild about the Brent Johnson selection to be honest...not that there's a lot to choose from...but with a coach like Bowman, you needed a guy that could play some games and Johnson never really played games for the Penguins...Bowman, a disciple of Toe Blake, was an excellent goalie manager. Johnson's career games played as a Penguin won't allow him to appear in enough games in a season to really be a factor and we know that Wregget has a history of wearing down later in the year, so that's gonna be a bit tough. Additionally, and not to crap on your pick or anything mrandall, really, I'm just calling it as I see it - I don't think you'll take it personally though, it's for the sake of discussion - additionally, Bowman has a history of favoring LHS-RHS, LHS-RHS, LHS-RHS complementary defensive pairs, something he also passed down to his disciples...'92 Penguins, '98 Red Wings, '02 Red Wings as examples. 70's Habs dynasty, admittedly, a counterpoint - but they'd be dominant regardless. But under any coach it would be a bit difficult as [unnamed team] has six LHS defensemen. Meh. At that point, it's getting down to minute details. Most of the remaining goalies are terrible (stats-wise, Johnson was the best available). In the end, it's a list of players. Your approach to this is way more in-depth than I think anyone would have realized. I also think that you're really nitpicking at stuff that people who aren't in on this would never realize had you not brought it up (hell, I don't think anyone but you would have brought it up). I said it to someone earlier, but just let me do my thing. I didn't do this to be guilt-tripped over who I'm picking. I don't mean to snap at you if it came off that way, but you are/were a pro scout. I'm not. I don't think the same way you do. Importance of handedness on forward lines depends on tactics, style, strengths/weaknesses, matchups, etc. Your consideration of LHS/RHS defensemen was in my head early on...sparked the trade to grab Woytowich over you. Yeah, I really didn't mean for that to come off as snappy. I just don't like being questioned in any draft setting because it makes me second guess myself and therefore makes it less enjoyable for me. I have my reasons for picking who I want, but like I said, you're noticing stuff that really no one else would unless they were you (like you said, calling it as you see it. Not sure many other people would have seen that). I'd like to point out that Ken Wregget is listed as a D in the Google Doc. With the 116th overall pick, I'd like to select Warren Young. A flash in the pan if there ever was one. The man scored 72 NHL goals, 40 of which came in ONE SEASON with the Penguins. Young has a nice story of determination and perseverance. 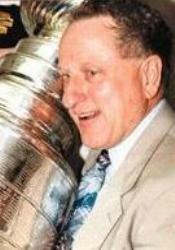 One of only 4 Penguins Head Coaches to make the cup and the first of three to win the Cup and the only coach to have his name on the Cup twice for the Penguins (1992 Posthumously), the man nicknamed Badger had left his mark on Pittsburgh despite only coaching one season in the Burgh. His trademark phrase "Its a great day for hockey" is still well known, and is a part of the Penguins as it can be seen at the main entrance of the CEC. I thought it was 100 for coaches? Me mal. But of all the coaches, Badger Bob is arguably the most influential head coach the Pens have ever had. Had he not fallen ill he easily would have eclipsed the 150 game mark and arguably was with the team even in death (as evidenced by his name appearing on the 2nd cup year). And who knows what would have been accomplished had he not gotten cancer. But I am arguing he is as important in his 100 games as any coach's 150. I don't disagree with you at all. In the spirit of fairness, some others may not have felt as if he was available (as per the OP) and they can decide what's right. Ignore me in the sense of "would mikey have drafted him? ", if the others are ok with it, then it's ok by me. If there's a problem we'll just work it out. I won't draft for a bit so that way in case there's an issue, you don't get burned by me (or others) taking the guy that was second on your list. I don't mind. But you had stated if you can make an argument for someone under the Games level that it should be brought up. I think it would be completely disingenuous to this draft if Badger Bob was not included. If the others say no then that is fine by me as I have made my arguments. But I do want to have a conversation about this before we move on. I have no qualms with letting Rylan take Badger Bob.